Locally owned and operated Maggie Mae&apos;s is an Austin legend. Crowds have been flowing into the Sixth Street hotspot since 1978, taking in the view from the largest rooftop in the entertainment district. Maggie Mae&apos;s boasts several types of entertainment, including a sports bar, complete with big screens for the game; an authentic English Pub suited for conversation; a New Orleans-style courtyard; the rooftop beneath the stars with a 27 foot movie screen; and three different stages outfitted for live music. The venue&apos;s four historic buildings have been beautifully restored and renovated, while maintain the historic charm that makes downtown Austin renowned, and together make for one of the largest entertainment venues downtown at 15,000 square feet. For over 37 years Maggie Mae&apos;s has been committed to offering a platform for Austin&apos;s musicians. Highly involved with the local music scene, guests can catch live music seven nights a week, sometimes several shows per day. On Thursday, Friday and Saturday nights there are three stages rocking with music. On late night weekends, there is always a rooftop DJ. The famous rooftop deck, outfitted with several bars, overlooks Sixth Street and offers a breathtaking panoramic view of Austin&apos;s growing skyline. The rooftop deck is the largest on Sixth Street with more than 5,000 square feet of space. 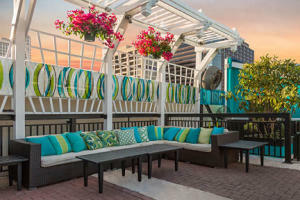 The rooftop was remodeled this year with vibrant colors, new lounge seating and amazing metal artwork created by renowned artist, Jon Allen. Hosting a party? The opportunity to dine al fresco with the sweeping view of downtown Austin makes any catered event an unforgettable experience. The Gibson Room has been completely renovated and has a private, red carpet entrance separate from the front doors to make events private and exclusive. It has a stage, a large bar, and lots of seating. 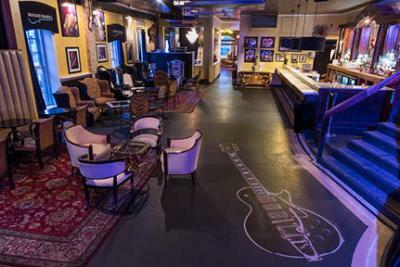 Behind the Gibson Room is the Les Paul Lounge, a smaller space that is outfitted with its own bar as well. Together they occupy the 5,000 square feet adjacent to the rooftop deck on the second level of Maggie Mae&apos;s. Sponsored by Gibson Guitars, the Gibson Lounge showcases some of the iconic guitarists who have played Gibson Guitars through the decades. Look for original art, unique displays, and original shows on Friday evenings. Artwork by world-renowned Austin artist Robert Hurst adorns the walls. The vibrant colors of Hurst&apos;s art complement the high energy of the live music and vibe on the stages. Hurst&apos;s artwork displays the guitarists in vibrant acrylics, while Eddie Kramer&apos;s photographs capture icons like The Rolling Stones and Jimi Hendrix in crystal black and white. The history of Maggie Mae&apos;s, and the legends that abound on Sixth Street, are truly alive in these rooms. Gibson Guitars has also provided examples of some of their guitars, which are beautifully displayed with the other iconic works of art. Jimmy Page&apos;s double-neck SG and Jimi Hendrix&apos;s Flying V are just two gems Maggie Mae&apos;s proudly houses. Events at Maggie Mae&apos;s are truly epic. Maggie Mae&apos;s prides itself on concierge touches and will accomplish practically anything to make your event unforgettable. From fine dining to movie premieres to weddings to armadillo races and, of course, live music... we&apos;ve done it and seen it all. There is way too much fun, art and exciting detail to explain what makes Maggie Mae&apos;s so special. It&apos;s the oldest standing bar on Sixth Street and still locally owned. When you walk in the doors, you can feel the passion of old downtown Austin, the music and the people that make this place epic. Don&apos;t miss it!